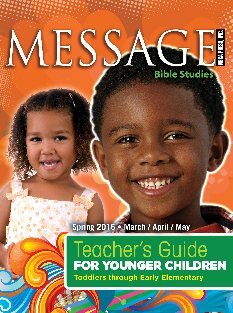 The Message Younger Children's Teacher Guide?For Toddlers through Early Elementary Students is formatted to include the following sections: "Beginning Block," "Bible Story Block," "Stacks of Fun," and "Closing Block." It also includes reproducible, fun-filled activities that reinforce the Bible teachings, and fun, interactive songs and poems. The Message Younger Children’s Teacher Guide—For Toddlers through Early Elementary Students is formatted to include the following sections: “Beginning Block,” “Bible Story Block,” “Stacks of Fun,” and “Closing Block.” It also includes reproducible, fun-filled activities that reinforce the Bible teachings, and fun, interactive songs and poems.